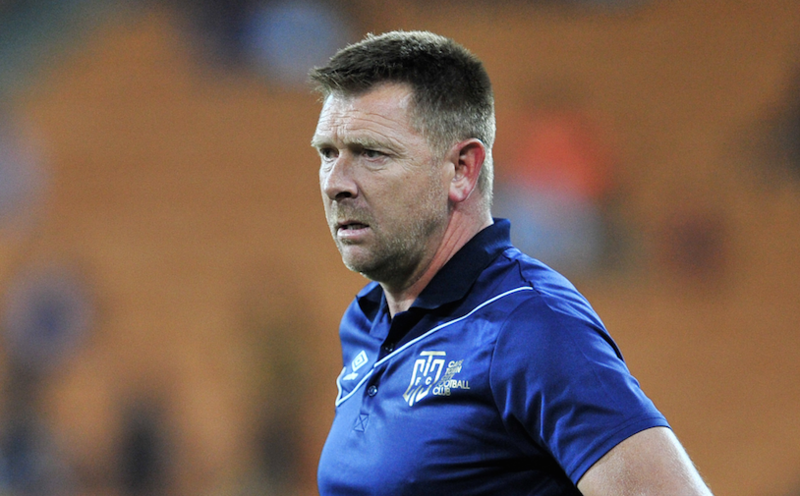 Eric Tinkler’s premature departure from the Cape Town City dugout could have a disastrous effect on the PSL underdogs, writes WADE PRETORIUS. Okay, so for starters I like Eric Tinkler as a coach. I backed him at Orlando Pirates and I did plead his case in a SportsClub magazine article (which I will link up for reference later) and was delighted to see him get the chance at Cape Town City when the axe fell at Pirates. City boss John Comitis praised the former Bafana Bafana midfielder’s work ethic, his knowledge and his qualifications when he was hired. While most of that may have been just posturing, there was also a lot of truth in his words. It quickly showed as City – a hodge-podge mix of players from Black Aces, a few imports and one or two signings – dumped Kaizer Chiefs out of the MTN8. Tinkler hasn’t had it all his own way this year – Matt Sim left after the mid-season break, there were injuries and Aubrey Modiba was sold – but his side continually punched way above their weight. Champions of the Telkom Knockout and serious title contenders – it was a case of job very, very well done for all involved in the setup. But in local football, how often is the coach the first one to take the blame when things go wrong? So then naturally, Tinkler is entitled to the first portion of the praise. He got the best out of Lebo Manyama, a player that has struggled in the past for any sort of consistency. Now, Manyama is a top PSL player and a strong contender to start for the national team. There are more than just a few success stories like his. City also boast a fine record against the ‘big three’ in SA – a trio that is quickly losing their place because of City’s impact on the league. The off-season was going well too. Ayanda Patosi was lured back from Belgium to join the Citizens – I wonder what he’ll be thinking after agreeing to come back to SA supposedly to work for Tinkler and his team. Will the likes of Manyama and Aubrey Ngoma, already linked with the biggest clubs in the country, have their heads turned as a result of Tinkler’s departure? Ruud Krol has been ‘spotted’ in Cape Town on ‘football business’, but we’ve seen time and time again that ‘big names’ can struggle in the Premiership. He is no guarantee of quick success even with his rich CV. Tinkler is entering the prime of his coaching career – he knows that at SuperSport he will have more financial muscle, a more developed youth structure and a host of big-name players. But with big power comes big responsibility, and he takes over from Stuart Baxter knowing that he must get his new side quickly in shape to become title contenders. Were Cape Town City one-hit wonders? We will never get the chance to find out, but what we will soon find out is whether Tinkler made the right choice in leaving the Mother City. One thing for sure, is that he won’t be given the luxury of any time to find his feet – it is contend or bust for him now.